Check out a nice report on Channel 5, from yesterday’s unveiling and opening! Just wait for the 15 second commercial to finish. 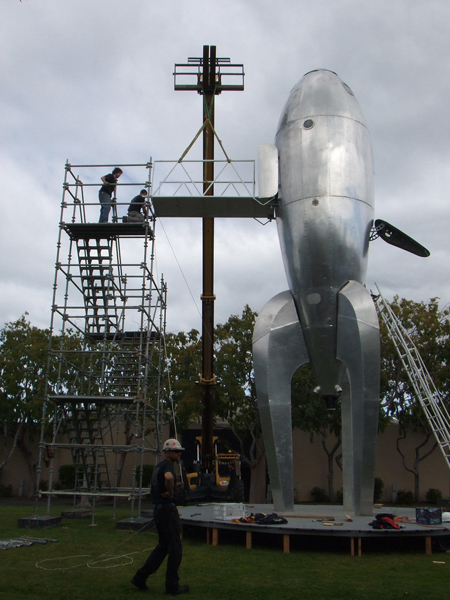 Black Rock Arts Foundation has just announced that the amazing Raygun Gothic Rocketship will be installed at Pier 14 in San Francisco thist August 2010 and will remain on display through September 2011. The 40-foot-tall art piece, The Raygun Gothic Rocketship, offers rococo-futuristic, highly-stylized vision of space travel circa 1930’s-1940’s science fiction and is the latest in a series of temporary public art exhibitions sponsored by BRAF with the aim of enlivening and activating public spaces. 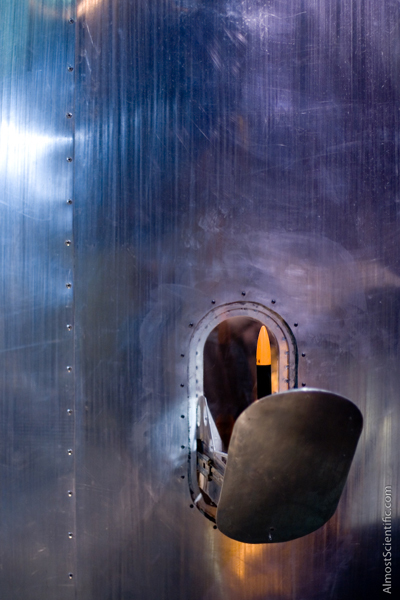 The installation first landed at Burning Man 2009, and has subsequently appeared at NASA Ames for Yuri’s Night, and at Maker Faire. 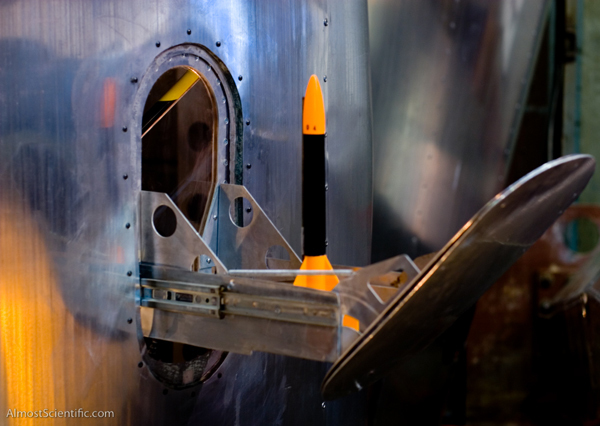 The piece is comprised of a single rocketship, poised as if to board passengers for a typical run to a nearby stellar destination. 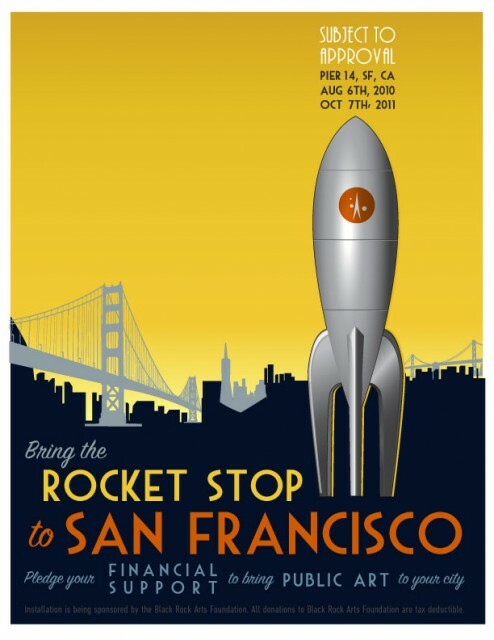 When installed in San Francisco, the sculpture will be accompanied by a descriptive exhibit, a “rocket stop”, which tells the story of the rocketship, provides route, schedule and other information. The installation will be illuminated for nighttime viewing. Although this ambitious project has won overwhelming city and public support and enthusiasm, we need your help to make it happen! 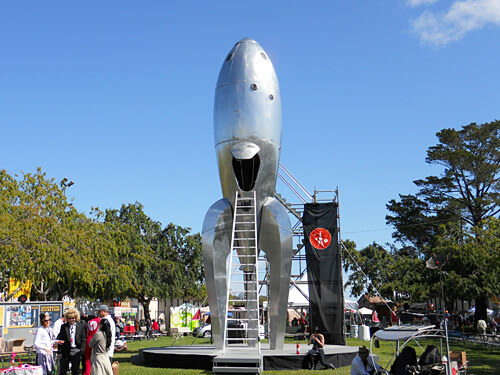 Help BRAF and the Raygun Gothic Rocketship crew make science fiction an everyday reality to hundreds of thousands of residents and visitors to the San Francisco Embarcadero. Here’s how you can donate to BRAF to help make this project a reality. Take a tour of the Rocketship with Wired.com. Check out today’s SF Examiner for the article about the hoped-for installation at Pier 14.